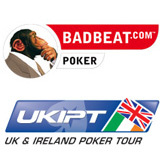 Three players sponsored and mentored by Badbeat.com finished in the money at the recent Newcastle leg of the UK and Ireland Poker Tour (UKIPT). Badbeat.com is the original and leading online poker staking site. With three years’ Badbeat sponsorship under his belt, Tim Slater finished in 5th place, adding £14,050 to his lifetime winnings. Johnathan Gawith took 6th place taking home £11,210, while Ralph Watson picked up £850 for his 59th place – having only under a year of mentorship and training from the poker staking giant. Every Badbeat.com player receives cutting-edge software tools and a structured development path with advanced learning aides, coupled with the knowledge, expertise and support from a pool of world class mentors and support staff. Next stop for Badbeat sponsored players is the World Series of Poker tournament in Las Vegas.